These temperatures must be reached and held for a specified amount of time. 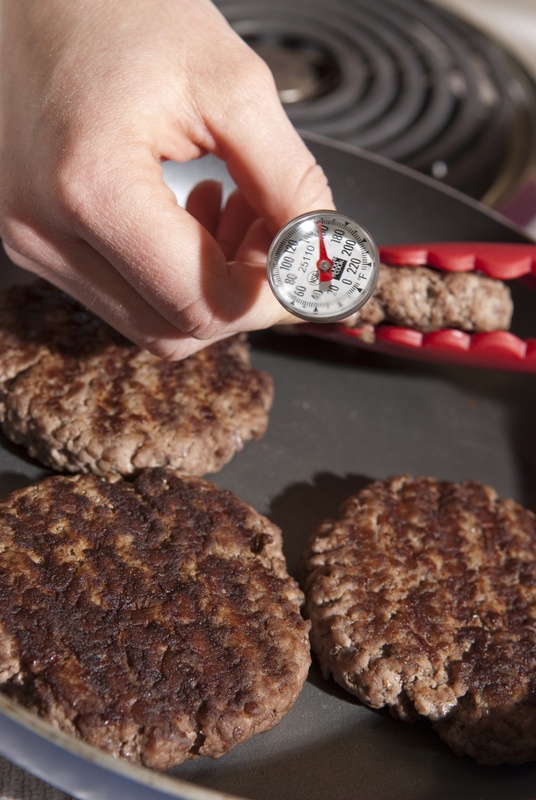 Use properly calibrated thermometers to measure the internal temperature of food. Measure internal temperatures in the thickest part of food and take at least two readings in different locations. If the food is too thin then stack them on top of each other and check temperature. This method works well with hamburgers and chicken breast. Keep your thermometer clean and sanitized. You should clean and sanitize after each use. I like to use alcohol wipes because it is quick and easy. You can purchase several different brands of sanitizer or make your own by using one gallon of room temperature water and one cap full of bleach. Use a separate bucket for sanitizers with a clean towel in it. After you clean your counter and equipment dry it with a clean cloth then wipe it down with the sanitizer and let it air dry. Do not dry it again with a cloth. Note: When you cook your food to the proper temperature not only is it safe but moist. Never over cook your food again. I like to check my food temperatures early and often. Make sure cloths or towels used for wiping spills are not used for any other purpose. I like to use disposable paper towels. Make sure you wash your hands between tasks. 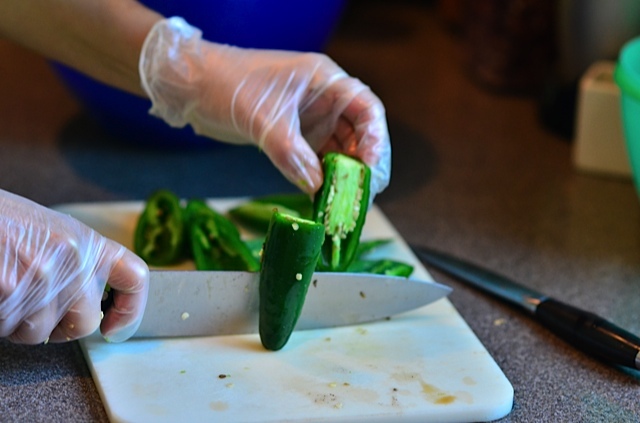 Consider using single-use gloves when preparing food. Wash your hands before putting on gloves. Gloves should be used only for a specific task and changed each time a new task is started. If gloves are punctured or ripped that gloves must be changed. Remember change your gloves. When I use to do food safety audits I always checked to see how many cases of gloves were purchased monthly to see if they were being used properly. Freezing food does not kill all microorganisms but it does slow their growth. When frozen food is thawed and exposed to the temperature danger zone microorganisms that are present will begin to grow and multiply. There are only four acceptable ways to thaw food. I do not recommend thawing your food submerged. 1. Place your food on a plate in a sanitized sink with the drain open with running, portable water at a temperature of 70 degrees F or lower. Water flow must be strong enough to wash loose food particles off into the drain. Remember to sanitize your sink after your food is thawed. 2. Place your food or raw meats in a separate area in your refrigerator underneath your ready to eat foods. The temperature of the refrigerator should be 41 degrees F or lower. 3. Place food in a microwave oven if the food will be cooked immediately after thawing. This is my favorite way to thaw frozen foods. I no longer throw away food left too long in the refrigerator. 4. Cook frozen food in the oven. Make sure you cook your food to meet the minimum internal cooking temperature. The two leading factors in food-born illness are temperature abuse and cross-contamination. The key to serving safe food is to handle food safely. Spend your time training your family in principles of sanitation time and temperature control. Following these guidelines will prevent food from being subject to time and temperature abuse. 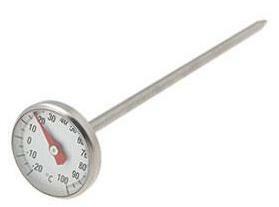 Have a bi-metallic stem thermometer available. You can find it in the kitchen gadget aisle at your local grocery store. When preparing food take out only as much food from storage as you can prepare at one time. For example: if you are breading six chicken breasts and are doing something else at the same time only take out two chicken breasts, bread them and then store them in your refrigerator. Then do the next two. Continue breading with the next two. Cook, hold, cool and reheat food properly. The idea is to not have six pieces of chicken sitting around unrefrigerated. I have teenagers who eat at different times due to school and work schedules so when I cook pasta I cook and serve, then put the rest in the refrigerator right a way. Do not leave it sitting on the counter. They can always reheat their dinner in the microwave. Cooling down the foods will be covered in a future article entitled “Leftovers”. When heating or cooling food, pass it through the middle of the temperature danger zone 70 degrees F to 120 degrees F as quickly as possible. Microorganisms grow faster in the middle of the range. Discard food if it spends more than four hours total in the temperature danger zone 41 degrees F to 140 degrees F. This includes time spent in the temperature danger zone during purchasing, storage, preparation and cooking and then again during cooling and reheating. Following these guidelines will prevent against cross- contamination. 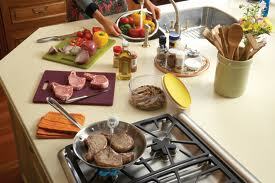 Prepare raw meats, fish and poultry in separate areas from produce or cooked or ready to eat foods. If space is not available prepare these items at different times. Assign specific equipment such as cutting boards, utensils and containers to each type of food product. For example, use one set of cutting boards utensils and containers just for poultry and another set for meat and a third set for produce. Clean and sanitize all work areas, equipment and utensils. If you have small children at home it is never too early to teach them good food safety skills. Start out with proper hand washing. It is a gift that will last a lifetime. Using a calibrated thermometer, take random temperatures of food stored in the refrigerator and freezer. A hanging thermometer should be placed in the back of the refrigerator and freezer and be easily checked. The temperature of the refrigerator should be 41 degrees or below. Store raw meat, poultry, and fish separately from cooked and ready to eat food whenever possible to prevent cross-contamination. The temperature of the freezer should be 0 degrees. Frozen storage temperature should keep frozen foods frozen.. Discard product if the expiration or use by date has passed and don’t forget “FIFO” first in first out. Use a black magic marker and mark all refrigerated and frozen food packages with the purchase date. To reduce the risk of cross-contamination never store cooked or ready to eat food below raw food. Use a red magic marker to write the expiration date. Shelve new supplies based on the use by or expiration date. Use the oldest items first. Discard food that has passed the expiration date. Do not try to cool off hot foods in your refrigerator or freezer. It will lower the temperature of your refrigerator and increase the risk of contamination. Always thaw frozen items in the refrigerator. Never thaw frozen items out on the counter at room temperature to thaw. It allows bacteria to grow. If in an emergency you need to thaw frozen items quickly place in a clean sink. Run a constant cold water stream over the item to be thawed. Do not allow the item to be immersed in water. If you use a microwave to thaw frozen items you need to thaw it and then cook it right away. Next month we will discuss properly cooling and storing of left-overs. I immediately knew what had happened! My wife had visited her mother and she had given her a box of dry goods from her house to take back to our house. So as you giggle a bit about our stuffing story, remember whenever you store anything, FIFO: First In First Out. When you get home from that shopping trip take all your dry goods and use a black marker to write that day’s date on it so when you reach in that cabinet use your oldest date first – hopefully it’s not three years old! When you contribute food to your local food drives remember to not give expired food. They throw away outdated donations by the dumpster load! Keep your dry storage areas cool and dry and well vented. Moisture and heat are the biggest dangers to dry and canned goods. The temperature of the storage area should be between 50 and 70 degrees Fahrenheit. If possible keep relative humidity at 50 – 60 percent. Store food in their original packaging. Once open store the product in airtight containers that are clearly labeled. Never buy or use dented cans. You are taking a chance with your family’s health if a hole or crack lets air into the can. Bacteria will grow into a common illness called botulism. Store dry goods at least six inches off the floor and out of direct sunlight. Remember FIFO: First In First Out. Check the expiration date on your dry goods. If you are past the date printed, throw it away NOT give it away. 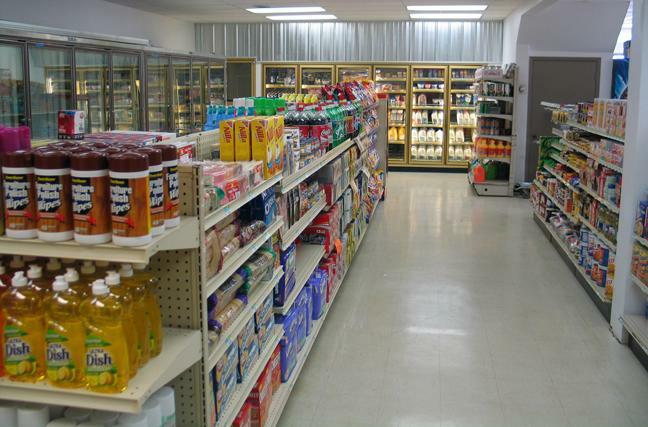 Our next article will be on storage of refrigerated and frozen items. The Hooksett Community Kitchen provides free meals to anyone wishing to attend every third Monday of the month from 5 pm to 7 pm. About the Author: I have spent the last 30 plus years in the Food Service Industry and have held many food safety certifications. I would like to take my professional experience and transform it to home use. We will start our journey at the very beginning. Food Safety starts with food shopping. Always plan to go straight home after food shopping. The time food spends out of the refrigerator all adds up to an hour to two hour shopping trip. Time and temperature abuse is a large problem. My personal belief is to shop at the large chain store and not at the small Mom and Pop store. Large chain stores have multi-million dollar brand names to protect so they spend a lot of time and money on food safety. I always purchase my non-perishable goods first and then purchase my refrigerated and frozen items last. Why? Because time and temperature are key to food shopping and are commonly abused. Food has been time and temperature abused anytime it has been allowed to remain for too long at the temperatures favorable for the growth of micro-organisms. Another time and temperature are abused is food left out of your fridge like when my teenager makes a sandwich and forgets to put back the mayonnaise or sandwich meat back in the fridge. The greatest danger to food safety are food born illnesses. A food born illness is a disease that is carried or transmitted to people by food. Each year millions of people become ill from food born illness although the majority of cases are not reported. Here are the most commonly reported causes of food born illness. 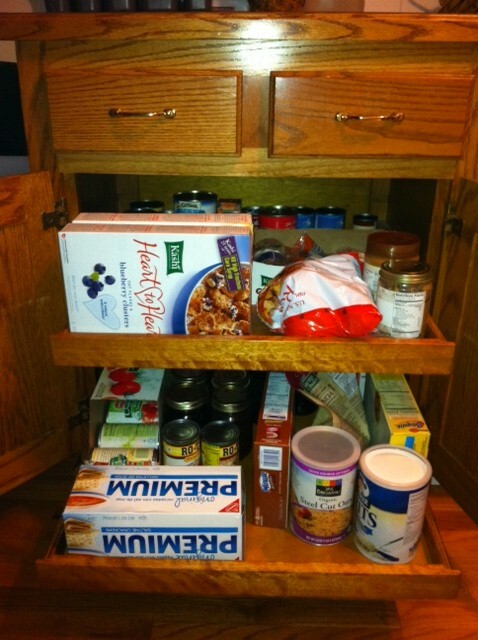 Look for my next article on food storage.